Traditionally, Chinese guardian lions represent yin and yang; one is male and one is female; and it’s good luck to rub their tongues. In Chinese culture, the lion sculptures flank gates and major entranceways. 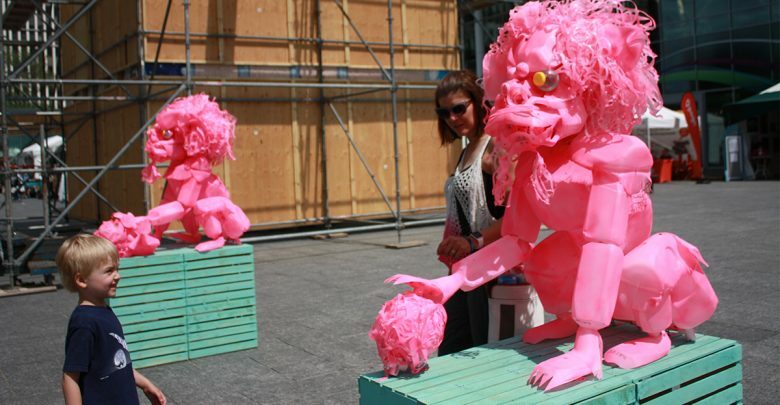 The pair of hot pink plastic lions that Edmonton artist Yong Fei Guan created for The Works Art & Design Festival, however, are in no way traditional. 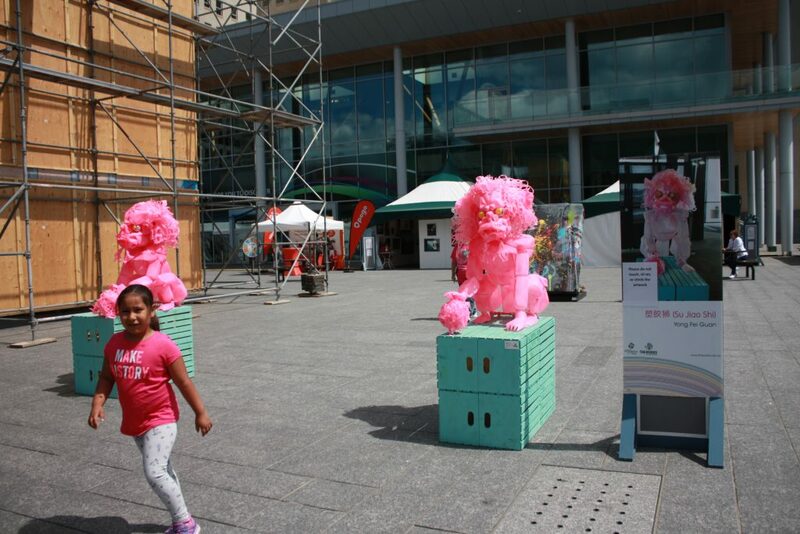 塑胶狮 (Su Jiao Shi), the name of Guan’s exhibit, translates to plastic lions, as opposed to shí shī, which translates to stone lions. Guan’s contemporary take on the traditional sculptures — made from found objects and reused materials like milk jugs, PVC pipe, six-pack rings, chicken wire, and children’s toys — play with ideas of permanence. Although she used to be a teacher in China, after immigrating to Canada in 2007, Guan completed her Bachelor of Fine Arts, starting at MacEwan University and finishing at Emily Carr University of Art + Design. She is now a full-time artist living in Edmonton. Guan is interested in how plastic waste, though permanent, can seem temporary, and how culture, especially that of immigrants, can be made temporary, regardless of how permanent its structures may appear. Since she moved to Canada, Guan says she has become deeply concerned about the environment, but when she was in China, she says wasn’t aware of environmental issues. According to Guan, the main goal of the average Chinese citizen – and, arguably, the Canadian citizen – is to build a decent life, making the environment the last priority. The removal of a major Chinese Edmontonian landmark, the Harbin Gate, on November 4th 2017 due to Valley Line LRT construction also inspired Guan. The City of Edmonton has placed the gate – a gift from Edmonton’s Chinese sister city of Harbin in 1987 – in storage with the Chinese Benevolent Association of Edmonton (CBA); however, the City has made no decisions to reinstall it. 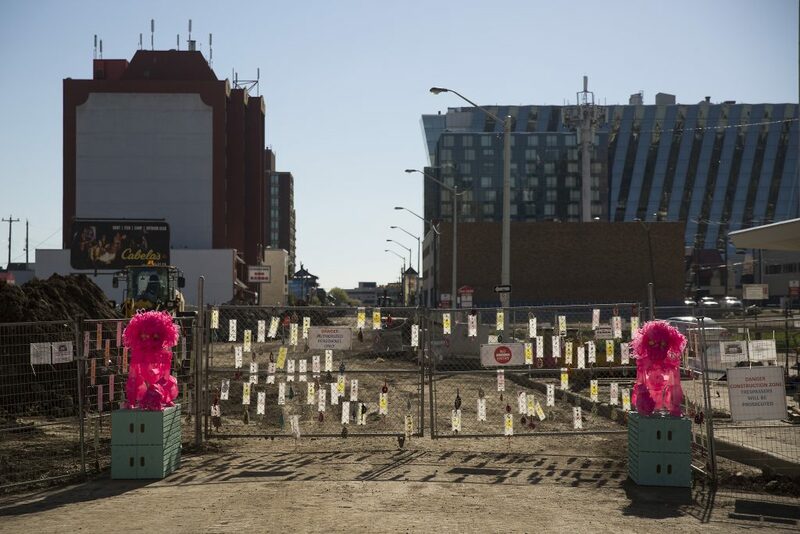 The CBA is skeptical of the possibility of reconstruction and does not expect that it will return to its original location due to the impending gentrification of Edmonton’s historical Chinatown area. Guan says she wanted to commemorate Edmonton’s guardian lions because she believes physical memory and cultural memory go hand in hand. Through Su Jiao Shi, Guan says she would also like to address the U of A’s Chinese international student population. She wants more people in the Chinese community to bring their voices into public conversation. The Works Society has partnered with Guan to display Su Jiao Shi at Edmonton City Hall. Although the dates of this installation are not set in stone, these guardian lions were never meant to be as concrete as their predecessors anyway.